Is it difficult to decide who you should hire for your film transfers? We always use the best equipment available, and we have years of experience in using the equipment. We were among the first in Europe to invest in a flashscan8 and several years before the companies that later followed out footstep in Sweden. It was a natural step for us to be the first transferhouse in Sweden to offer HD transfers from 8mm film. We follow the technology and continously invest in the best hardware available. That is why we got rid of the old and outdated flashscan8 in favor of the new and heavly enhanced version, the flashscanHD. FlashscanHD is the best 8mm scanner available today, with HD-resolution 3CCD chip and unique skills like hardware lazer image stabilizing and the capacity to transfer film with damaged perforation (the small holes on the side of the film). But it is now, in the middle of all talk about hardware, that it is important to remember the foundation of all film transfers. It is not the equipment itself that stands for the majority of the quality delivered, it is the operator that continously supervises the transfer, adjust the colorbalance, sharpness, gamma, blacklevels. Without a experienced telecine operator even the best equipment available cannot produce top notch quality. And then you need to have skilled colorists that can take care of the post production in editing programs. It is the combination of a deep interest, the best equipment available and both experienced and commited staff that makes us stand out from the crowd. The magazine Ljud & Bild undertook a major test in which they compared the image quality of 8mm filmtransfers from several of the biggest transferhouses in Sweden. We won the test. Maybe it's because we have more experience with old films than the competing companies? Read quotations from the test. Uppsala Bildteknik AB has a basic pricepolicy, low prices that are easy to figure out in advance. Not a lot of odd additions, or start-fees. We do not want to attract with a ultra low price and then build it up with this and that. Musicvideos in Sweden that are produced with 8mm films are almost always transferred by us, we receive musicvideos from all across Europe for transfer. Here you'll find a selection of music videos from 8mm films that we have transferred. Productions that need transfers from old 8mm films to various TV features hire us for the transfer, such as Babyboom on TV4. The quality must be high, it is the most important thing. 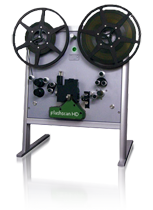 We don´t mind boasting about us delivering the best image quality from 8mm filmtransfers in Sweden. If the delivery times sometimes gets a little longer, so be it. We will not drop our standards. It is perhaps for this reason we get orders even from abroad. Clearly the majority of orders come from Sweden, but we have also received orders from other countries such as Norway, Finland, Denmark, England, France, Spain, Portugal, Italy, Switzerland and Poland. The best quality at the best price in Sweden, that is what we deliver. We guarantee it. You doubt us? Use our price guarantee and see if the prices really are lower after a competing company's price list.